There’s really no question where I inherited my Do-It-Yourself style. My dad, Allyn Thompson, has always been a jack of all trades and master of many. Mechanic, watch repairman, machinist, gun smith, woodworker, carver, artist, metal worker, cartoonist, (I know I’ve left out a dozen or so other talents,) and a guy who can crank out a little ragtime on the ivories or harmonica at any given moment. Always a maker and fixer- if there is a tool he needs, he rarely buys it, he makes it, or invents it. Serving in both the US Army and Navy, I am forever proud of my ol’ Pop. He is the funniest man I know in the whole world. He turns 80 next week, and has been unable to spend as much time as he would like in his shop garage, but continues to be a great source of inspiration to me. I miss him dearly as he lives in San Antonio, Texas, far, far away. I know you’ll read this Pop, I wish you a very happy Father’s Day, I love you forever. Happy Father’s Day to all the Dads, and as well, to all those who miss theirs. This entry was posted in Uncategorized and tagged Al Thompson, Allyn Thompson, diy, Father's Day. Bookmark the permalink. What a SWEET post Cathe! I wish your crafty Daddy a happy happy Father's Day! Don't you just love a DADDY that DOES it all! My Daddy LOVES to make things with WOOD! And you should see what a mess he makes in his shop! Oh me! Drives my Mama crazy! I just posted about my DADDY too! What would the world be without our Daddies! Oh this is so beautiful. I don't have mine anymore, but I do have wonderful memories. What a great father you have. I hope you get to visit him soon. Aww…what a precious post and Happy Father's day to one that inspires you so much! What a neat photograph of your dad, doing what makes him happy!! Now I see from where you got the talent!! What a lovely tribute to a great father-daughter relationship. How proud you must both be of each other's talents. What a lovely tribute to your dad, Cathe. And I just love the photo you chose to include – it speaks volumes! What a wonderful post. Your dad sounds awesome! Oh yes, for me it's the same! My Dad is the one where I got my Do-It-Yourself style from. If it's a metal working lathe machine (I don't know the right word) on this photo, my Dad has one in his garage too. I'm very proud of my Dad! Greetings from Germany! The apple didn't fall far from the tree! Happy father's day to your special dad! 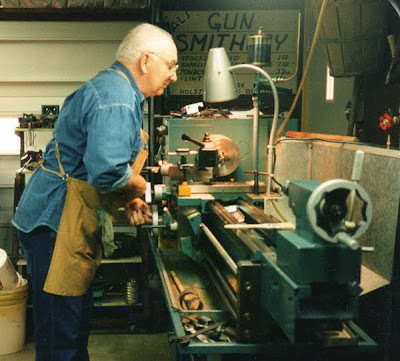 What a wonderful photo of your dad in his workshop doing what he loves. It does seem like you inherited your creative talents from him, as you both are accomplished in so many areas. Your dad must be very proud of you also, Cathe! This is such a WONDERFUL tribute to an extraordinary man – it's easy from where YOUR apple fell, and why you are SO mighty talented, yourself! I've got the major "dad envy" on this day, as mine left far too soon. I'm drinking in the love you've expressed here – it's beautiful! Enjoy the Dads in your world and have a beautiful rest of this lovely day! Congrats, Mr. Thompson, to your 80th birthday! Having such a dad is a wonderful thing and I enjoy every day I'm able to spent with mine. Glad that he only lives about 5 miles away. What a great message to your wonerful dad. Coincidentally, I'll be taking my dad and mom to San Antonio in a couple of weeks when they come visit us from NJ. My dad died suddenly playing golf at the age of 59. He was a do-it-yourself dad too; loved digging wells, making his own deodorant, self-taught metal engineer, avid reader, etc. That was 40 years ago and i still miss him! he would have loved our independant and successful daughters. Family is everything. Thanks for sharing your dad with the world. You are a lucky gal! Aww… what a great tribute! TFS this. Love the picture, too! He's so cute! I have learned so much from our Pop. His garage is the Willie Wonka factory of workshops! What a wonderful photo! He's so cute. I have learned so much from our Pop in his Willy Wonka factory of garage workshop! What a sweet photo.